​We think of joint ventures between art and science as innovative, but it seems to me that there was a time when “natural history” used to be an integrated language that addressed human-nature relationships, allowing for emotion and subjectivity in the description of nature. In the race for disciplinary excellence, we have forgotten or unlearned this personal engagement, probably for good reason. Today, there is a need for arts and science collaborations, as they can help to re-set our minds for a plural perception of nature. These partnerships remain hard work but bring high pay-off. 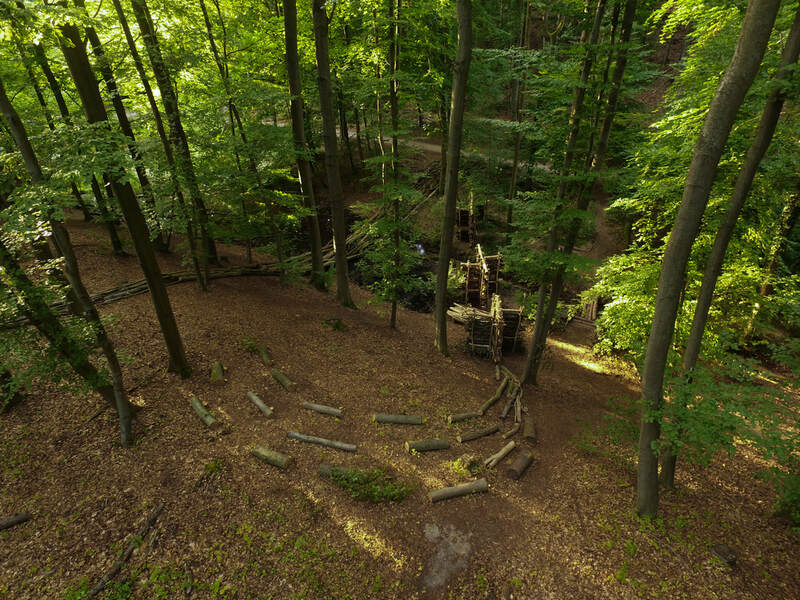 Last December, I was invited to a dialogue with landscape artist Joachim Jacob, from Hamburg, to develop a proposal for the 9th international Forest Art Trail, a biennial LandArt and EcoArt expo in Darmstadt, Germany. This year's topic “Art Ecology” inspired Joachim to seek a partner from the ecological sciences. After studying biology, philosophy, and architecture, Joachim started creating landscape art in the 90s. I’m an ecologist and environmental scientist with a PhD in theoretical ecology, collaborating in transdisciplinary research projects with social scientists on the topic of biodiversity valuation and philosophy of science. Thus, we both came into this dialogue with strong cross-disciplinary literacy. 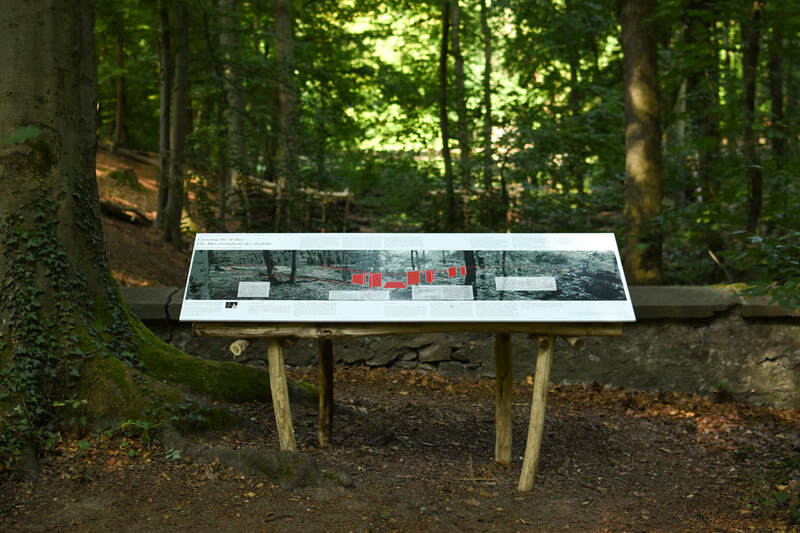 A glimpse on the artwork “Crossing the Valley – The metamorphosis of decay” (Joachim Jacob & Florian D. Schneider, 2018, Darmstadt, Germany) below the trees across the Goethe-Teich, a pond near Darmstadt, Germany, where the German poet Johann Wolfgang von Goethe used to meet with friends and fellow artists. 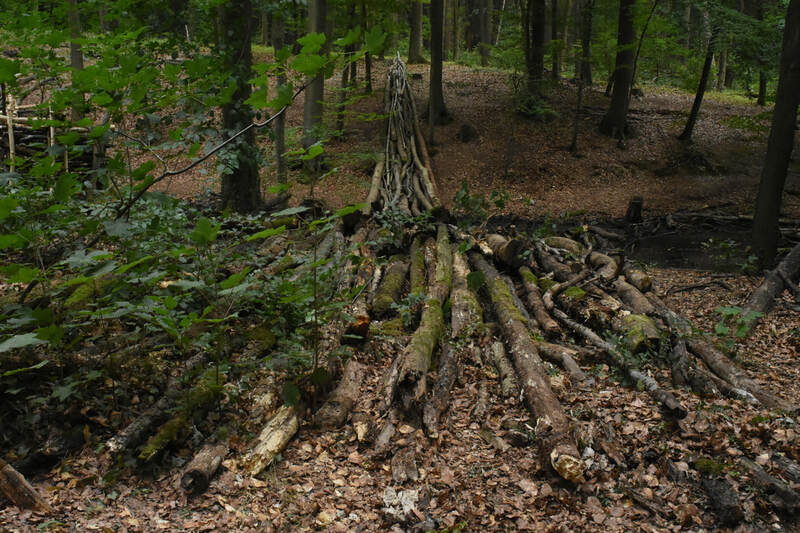 ​Our own thematic backgrounds, but also the site itself – a little valley at the inlet to a pond, where we found a heap of tree trunks in different stages of decay – made us converge on the ecological topic of deadwood decomposition. We were intrigued by the symbolism of “the Valley of Death” or “River Styx” that needs to be crossed as the ultimate dichotomy of life and death. But decay is not like that. It’s a continuous metamorphosis and full of life itself. It brings about new fertile soil and closes the infinite cycle. We wanted to show that in an engaging way, lure visitors in to watch closely and discover the wonders of the microcosm world adding up to the large-scale process of decomposition. Aerial view of “Crossing the Valley – The metamorphosis of decay” (Joachim Jacob & Florian D. Schneider, 2018, Darmstadt, Germany), showing its two landscape-scale forms. The straight “Gradient” crosses the small valley above the Goethe-Teich (front) and is made of tree trunks ordered according to their degree of decomposition. The S-shaped “Integral” (back) forms the conceptual complement, with three standing walls filled with deadwood of three different stages of decomposition. Photo credit: Christian Büchner. Image of the Gradient. Deadwood decomposition is a slow and miniature process, involving myriads of organisms, that can hardly be observed since it is highly dislocated in space, and since it takes more than a human lifetime to complete. By ordering the trees by their level of decay, we applied a space-for-time substitution, a common method in ecological research, to make it accessible. ​But the more we spoke, the more it turned out that we had a desire to reflect on the cultural process itself as a type of cyclic construction and decomposition. We were going back to Johann Wolfgang von Goethe and Alexander von Humboldt. Their friendship and dialogue led Goethe to write his “Faust” and Humboldt to develop his holistic idea of complex human-nature interdependencies, which German zoologist Ernst Haeckel later framed into the singular term “ecology.” It was also Haeckel who led artists, designers, and architects to find inspiration in the variety and richness of nature with his immensely popular illustrations “Kunstformen der Natur.” It was not until the 1980s that this concept of natural richness was minted into the term “biodiversity.” Beyond a mere description of species richness, contemporary environmental science aims for halting biodiversity decline by framing it as a problem embedded in complex social-ecological systems. This historic development should teach us that scientific progress is not happening in isolation of an “ivory tower.” It is and always has been part of a cultural process. The environmental art movement escaped the galleries and museums in the 1960s. In Europe, artists took on natural materials and addressed topics of ecology, like human land-use and nature depletion. Their works explored ecological aesthetics as a concept of human-nature communication and a boundary object between ecology and art. In this tradition, Joachim’s work emphasizes form and ornament of natural materials and the metamorphosis of these features over time. His research process is always dedicated to site specificity and materials found at hand. The immersion of the observer’s body into the artwork is a key feature of his landscape-scale art. The artwork is to be explored with all senses. The observer can move within, can interact with its forms and materials and – in the process of observation – become a part of it. The walls of the Integral contain dead wood in distinct stages of decay. 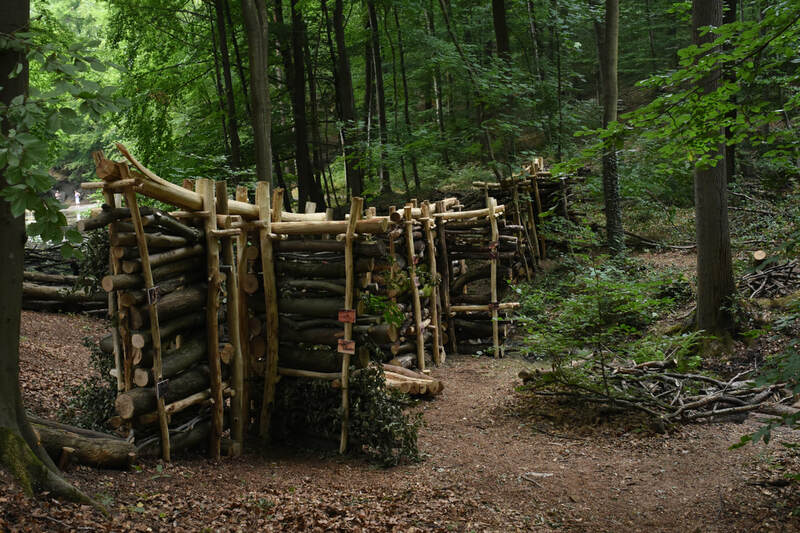 With its various points of view towards the Gradient, and the possibility to get first-hand sensory impressions of the dead wood, the walls can become a space of experience and insight. ​In retrospect, our disciplinary ideas evolved into an interdisciplinary dialogue, started to overlap and interact, and a concept for an artwork emerged out of it. We realized that only in the moment of implementation – in naturam at the chosen site – our differing ideas of the concept would manifest into a single item in the real world. However, it was clear to us that a gap would remain between our perspectives, our emphasis of certain aspects of the artwork, our own positioning in the installation. With “Crossing the Valley – The Metamorphosis of Decay,” we created a space to experience and explore the complex ecological processes and the diversity of organisms that transform dead wood into fertile soil as a source of new life. But beyond a mere visualization of scientific knowledge, our interdisciplinary dialogue reflects on the inner workings of art and science as cultural processes and how they are forming our concepts of continuously flowing, natural processes. In fact, “Crossing the Valley” has grown into an epistemic sculpture, a physical model of how we make sense of the world around us. Aerial view of the Integral. Decomposition is a complex process, a continuous succession of organisms with no apparent distinction of “stages” or “levels”. Science defines these stages depending on own disciplinary criteria. Although arbitrary, this framing into well-defined concepts enables us to talk about the gradual process in a meaningful way. On a larger scale, concepts like “Ecology” or “Biodiversity” are also just scientific social constructs representing natural phenomena. The Integral, with its three walls, is our representation of this layer of concepts and convention, contrasted by the Gradient, which – while showing a clear pattern – remains in the distance, inaccessible (some of the tree trunks are placed in the mud and water of the pond). Photo credit: Christian Büchner. There is a third layer of knowledge, which is the philosophical reflection on our own practice of “making sense of the world”. The information panel, with its scientific layout and conceptual graphics, is representing this layer of epistemological discourse. We placed it in far distance from the Gradient, to stumble upon when leaving the artwork, and only for those who seek it. When scientists perceive natural reality by experimentation and measurement, it is always through a lens of paradigmatic concepts and abstract terms that arise from the history and theory of a field, as well as its societal context. 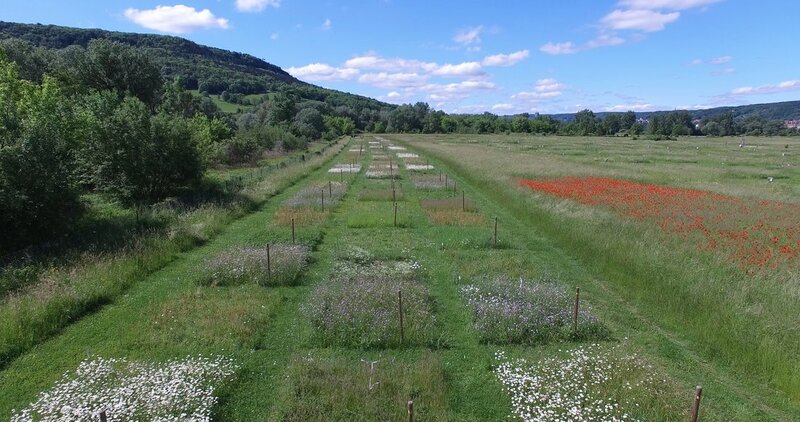 A key aspect of today’s ecological research is the design of landscape-scale experiments such as the Jena Experiment, where different grassland biodiversity-treatments are setup to observe changes in ecosystem-level processes. Analogue to the sculpting and architectural process of landscape art, field experiments are a mode of creating a life model, in which one can observe and probe, an artifact to enable direct experience (enhanced by sensors). The design of the experiment is informed by the prior theory and aims to exclude non-target causes and noise. The observation, while primed by the design, will advance and refine the theory, answer specific questions or induce new questions. Getting our hands dirty in experiments will always remain a key part of knowledge generation. LandArt sculptures and large-scale scientific experiments have much in common, as the work of British artist Rebecca Chesney illustrates. 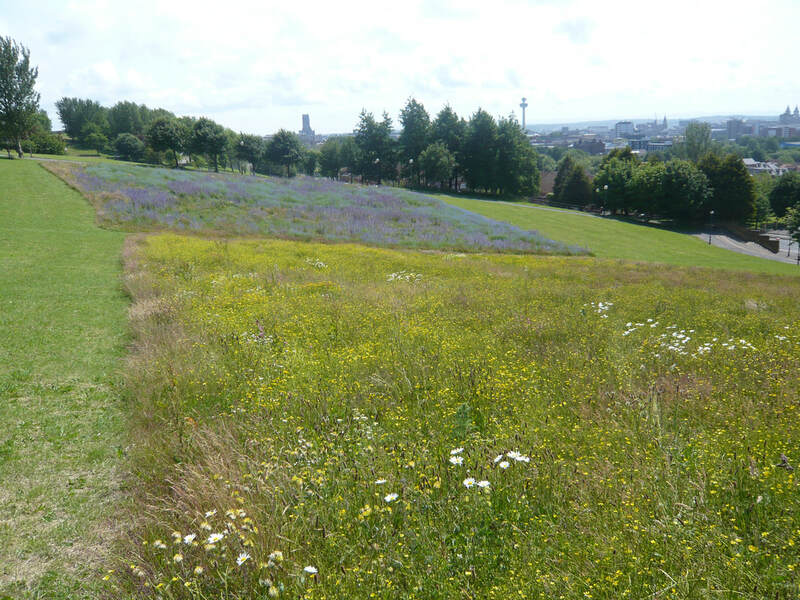 Her work “I am blue, you’re yellow” (2012, Everton Park, Liverpool, UK) turned a deprived lawn into a rich flower meadow, attracting pollinators & human visitors (image on left, photo credit: Rebecca Chesney [http://rebeccachesney.com/]). In collaboration with scientists, she monitors the change of plants and bee species over time. 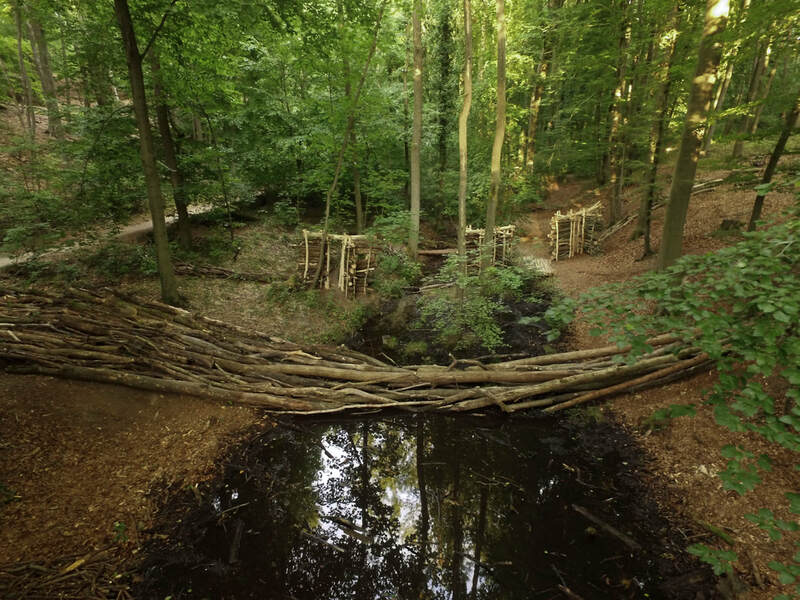 Rebecca’s installation is of stunning similarity to large-scale biodiversity experiments like the Jena Experiment (image on right, photo credit: The Jena Experiment [http://www.the-jena-experiment.de/]). These investigate the change of ecosystem functioning along an artificial gradient. The art visitor and the researcher can walk inside the painting/experiment, and observe, probe and comprehend. ​While this insight on experiments is not new (philosophy of science has described the purpose of experiments in depth), I believe we can learn something from Joachim’s approach to landscape-scale sculpture: we might think about the observer as an agent within the experiment, a part of the set-up. Rather than striving for the elimination of all observer bias (which may be impossible anyway), we might as well see it as a feature. The observer is the part of the setup that interprets and views things from different subjective angles, with different cultural background and context. By having a physical model of a theory exposed to different subjective viewpoints, for instance by other disciplinary researchers, by non-scientific stakeholders, or by artists, the patterns in the natural processes would be reflected in new light and, through dialogue and discussion, might lead to the finding of a completely new theory. The project made me think about the subjectivity vs. objectivity of arts and science: it seems inherent to art that no one really gets to define what "art" is, or who is accredited to create “art.” The common cliché is, that art must be subjective, break with conventions and definitions, to come up with completely new ideas “out of a blue sky.” These ideas are the opposite of the scientific ideal of “dwarves standing on the shoulders of giants.” Scientific achievement must be built on prior findings, and backed by independent observation, to become plausible and credible. I’ve come to learn that those contrasting notions of objective and subjective ideals in science and art, respectively, are nothing but a myth. Art is driven by citations, labels, and hypes on the market as much as science is defined by individual ideals, political context, and uber-mighty gatekeepers. It would be healthy to acknowledge that the two are not that different after all and to see the richness that lies within. In that regard, the dialogue between Joachim and myself was rich in curiosity and mutual appreciation for the other’s viewpoint. However, we also discussed the difficulties to overcome in such dialogues, informed by own experience and lessons learned by fellow artists and scientists. Besides disciplinary language barriers, there seems to be a mismatch of expectations. For instance, while scientists may want their work communicated through art, artists might look to science not only as an inspirational resource, but rather as raw material which they can work and form. Scientists might appreciate the opportunity for outreach, but not see it as an input to their work. On the other hand, scientists are disappointed by the lack of accuracy or the excess of abstraction that the artist implements. As a scientist, I think we could achieve much more by embracing other modes of knowledge generation, like the arts. 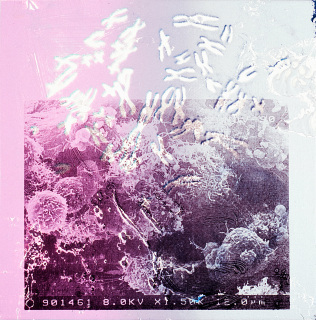 Art and science collaborations are an opportunity to step outside the formal system, seeing things with fresh minds. Ideally the artwork will become a valid contribution to the topic of research and inform the future scientific development. There is no need for science to have an exclusive right to describing natural realities. We can only benefit from allowing a plurality of perspectives. Florian D. Schneider (left) and Joachim Jacob (right). Photo courtesy of the author. ​Florian D. Schneider is an ecologist and environmental scientist working on topics of biodiversity semantics and nature valuation. He is a research generalist, with works ranging across theoretical ecology, bioinformatics, social-ecological systems, science-policy, and philosophy of science. He served as the scientific secretary of the senate commission on biodiversity research for the German Research Foundation (DFG). After stations at Technische Universität Darmstadt, CNRS Montpellier, and Senckenberg Biodiversity and Climate – Research Center, he now works as a freelance biologist for several research institutions.